IndusInd Bank has launched the IndusInd Bank Nexxt Credit Card – the first interactive Credit Card in India with buttons – which provides customers with the flexibility of three payment options at a Point of Sale (POS) terminal – Credit, Converting Transactions into EMIs with 4 tenure options (6, 12, 18 & 24 months) or using accumulated Reward Points, by simply pushing a button on the card. It incorporates technology that is revolutionary for a payment card, and provides exceptional consumer functionality as well as value. It indicates a customer’s desired payment choice using LED lights associated with the three options. A customer does not need to fill any paperwork, or call their bank, or log in to any banking channel to convert their POS transactions into EMIs, or to redeem their Rewards Points. 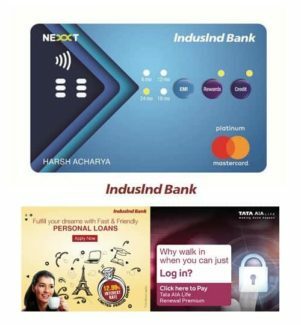 The IndusInd Bank Nexxt Credit Card is loaded with features that will elevate the shopping experience for customers through entertainment offers, concierge services, lounge access, fuel surcharge waiver, reward earnings and reward redemptions. The Card also comes with the exclusive Nexxt Reward Points, which further add to the bouquet of customer benefits. IndusInd Bank, which commenced operations in 1994, caters to the needs of both consumer and corporate customers. Its technology platform supports multi-channel delivery capabilities. As on September 30, 2018, IndusInd Bank has 1466 branches including 203 specialized branches, and 2372 ATMs spread across geographical locations of the country. The Bank also has representative offices in London, Dubai, Abu Dhabi and Doha. The Bank believes in driving its business through technology. It enjoys clearing bank status for both major stock exchanges – BSE and NSE – and major commodity exchanges in the country, including MCX, NCDEX, and NMCE. IndusInd Bank on April 1, 2013 was included in the NIFTY 50 benchmark index. Recently, IndusInd Bank was awarded Best Commercial Bank of the Year (India) and Best Innovation in Retail Banking (India) by International Banker 2018 Awards.